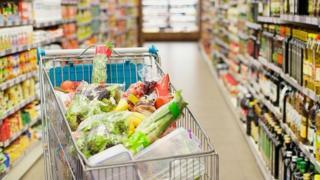 Scottish retailers have reported another "disappointing" month, following a sharp fall in non-food sales. Total sales in March were 2.1% down on a year ago, according to the Scottish Retail Consortium-KPMG Retail Sales Monitor. Adjusted for deflation, measured at 0.8%, overall sales last month declined by 1.3%. Food sales were up 1.8%, but non-food sales dropped 5.2%. Experts said the figures had been "heavily distorted" by a late Easter. Scottish Retail Consortium director David Lonsdale said sales were in line with the "somewhat disappointing" performance recorded by retailers so far this year. He said: "Despite retailers' efforts to absorb costs, the impact of the fall in sterling on commodity prices is now clearly being seen through food price inflation. "That's contributed to improved food sales of 1.8%. However, the concern is that consumers spending more on food are shifting spending from other items, potentially exacerbating the stresses affecting non-food retailers. "Retailers will now look nervously forwards to Easter, hoping this month's depressed figures are a result of deferred, rather than reduced, consumer spending." Craig Cavin, head of retail in Scotland for KPMG, added: "March's headline retail and non-food figures may cause concern at first glance, but a late Easter has negatively distorted the numbers. "Retailers will be on the lookout for a bumper April, with school holidays bringing increased footfall and retail traffic."